Last week I took my five boys to the playground to meet some friends and somehow or another ended up taking ten boys home with me. It’s funny how that happens sometimes. I was happy I had the extras around, though, because I was working on a few recipes and needed some unvarnished opinions. One of the recipes I had on the docket was one I had made previously for my family but wanted to make again for the purposes of double-checking myself. I was brushing up on my finger food skills and had done my own version of the cheese breads that have circulated the great interwebs for some time. Why work on snacks right now? Not to make you panic or anything, but you have eight days until the NFL football season officially starts. That’s right, you have eight days to get yourself in gear for snack food season. If you have kids playing football, you’re already in the thick of it. Even more importantly (to me), the season premiere of Doctor Who is on Sunday. Hello. This year is so very timey wimey. This clearly requires food, and lots of it. Have you wrapped your brain around all the delicious possibilities yet? 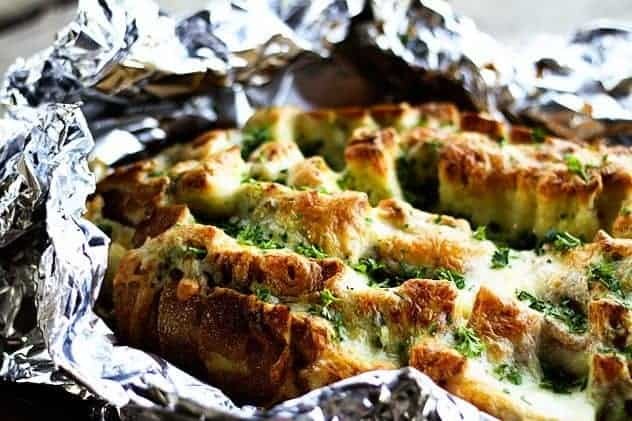 This cheese bread is just about the perfect option. It doesn’t require any exotic ingredients, it’s easy as can be to put together, it can be cooked in your oven or on a grill at a tailgating party, and it’s a serious crowd pleaser. In fact, when I said, “Go ahead, guys… dig in…” This is what happened. What you can’t see in this picture is my husband sitting off to the right growling because the boys’ hands got to the bread before his did. Behold the power of the cheesy bread. Right after this picture was snapped, The Evil Genius performed a perfect swan dive directly into the center of that loaf. He proclaimed it to be dangerously good. The boys (mine and the others) concurred. Then there were requests. My boys asked to have it at their birthdays. Their friends asked that I serve these at the boys’ birthdays. Then one friend asked that at the next sleepover, I ONLY serve this bread, and lots of it. I’d say that’s pretty successful wouldn’t you? Those boys are no fools: they know good food when they taste it. It’s hard to go wrong when you start with soft-on-the-inside/crusty-on-the-outside Italian bread that is cut into grab-able squares, generously doused with melted butter mixed with minced green onion and garlic, toasted til hot and tender, then crammed full of Cheddar cheese and baked until bubbly with browned bits of cheese capping it. I suppose the shower of chopped parsley at the end is strictly optional, but it does look nice and it at least makes a valiant attempt to add some breath freshening to the party. Like a fool, I told the boys about the cook’s tax (the crispy bits of cheese stuck to the foil after the bread is gone) and like the smart young men they are, they ate all of it. I’d better go grate some cheese. Soft-on-the-inside/crusty-on-the-outside Italian bread that is cut into grab-able squares, generously doused with melted butter mixed with minced green onion and garlic, toasted til hot and tender, then crammed full of Cheddar cheese and baked until bubbly with browned bits of cheese capping it. This is a true crowd-pleaser! In a microwave safe bowl, or a heavy-bottomed skillet, heat the butter until melted and mix in the garlic and sliced green onions. Stir with a serving spoon. Lay the loaf of bread on the cutting board and cut a ½” grid pattern into it stopping about ¼” above the base of the bread so that it stays connected. Gently pry apart the bread and spoon the butter mixture along the seams. Gently wrap the foil up around the top of the loaf and put on a rimmed baking sheet. Bake for 10 minutes. Remove the pan from the oven, open the foil and sprinkle the Cheddar cheese over the top, gently pushing some of the cheese down into the cut bread. 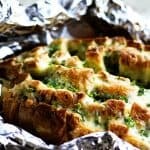 Leave the foil open and return the pan to the oven or grill and raise the heat to 425°F or HIGH for another 15 minutes or until the cheese is completely melted and bubbly and lightly browned on top. Let set for 3 minutes before showering with freshly minced parsley and serving. Oh, Rebecca….Rebecca, Rebecca, Rebecca. If this is what will be served during football games, I’m watching ALL of them at YOUR house! YES! My plan worked! Of course this is served at football games here… And Doctor Who premieres 🙂 See you on Saturday? Sunday? Yes! I made something similar last year, and it’s sooooo good! So amazing! This is perfect for football season! Bread sounds great, but more to the point — I don’t want you to need a Tardis yourself — The Doctor is in on Saturday, Sept. 1 at 9 p.m. on BBC America. Better excuse for snacking (and not on fish fingers) that the NFL in my book. 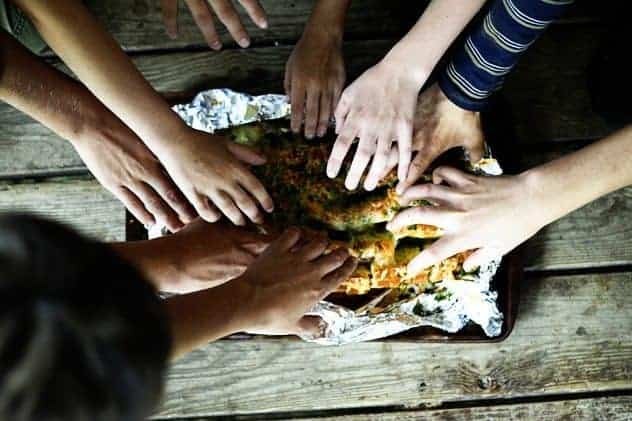 um, this makes me with i had 8 hands that i could shovel this bread into my face with! This looks wonderful! How does it hold up with re-heating? No wonder they couldn’t wait to dig it. This snack looks really delicious! Oh my gosh this bread looks so good – the name totally caught my attention with college football starting! YUM! I will make two loafs one to share one for me. 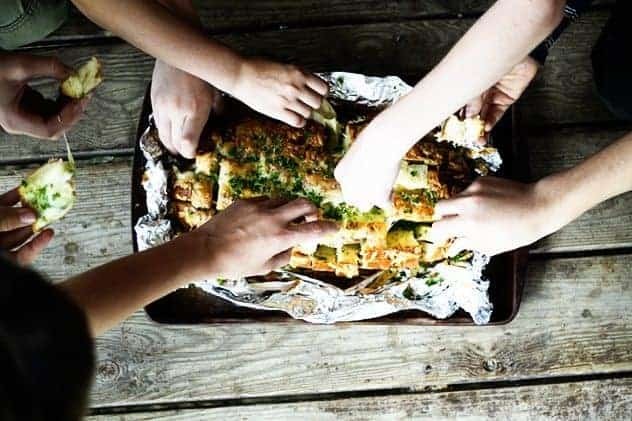 Italian bread, cheese, scallions, and garlic – oh my…. I’m in! The only thing I’d need with this deliciousness is a glass of Finger Lakes wine to wash it down! Next time your making it give me a shout Rebecca. I don’t live that far away – lol! I need this in my life. Bread + cheese… totally hogging it to myself! I cannot. I just…oh my goodness me…that just looks…so…amazing. I can’t decide which is more exciting. The start of college football season or this bread. I think I’m going to have to go with the bread. Wow, this looks delicious! My family doesn’t watch sports much, but we do love garlic bread. I’m always looking for a new and better way to make it. I’m definitely trying this! Oh My! Can’t wait to try this! Definately on the menu on Superbowl Sunday! I made this for a christmas party and it was a huge it!!! thanks…. Well, this bread was a total hit at our VBS this week for the staff! We all take turns bringing in snacks for the staff and today I brought this. Thank heavens it was easy. It wasn’t easy trying to get 3 little ones out the door with all their stuff AND make snacks too. BUT this! WOW! Baked half of it at home, took it to church and baked the cheese on. Then, everyone smelled the garlic and cheese and I guess I didn’t make enough! lol Thanks for posting all the yummy recipes! This looks like the perfect recipe for a pull a part muffaletta. Think this will be my next recipe to post! Thanks for the inspiration Rebecca. Rebecca, should I use “white sharp chedder cheese” or should I be using the “orange sharp cheddar cheese”? Would it taste good cold? Need to make in the morning and wouldn’t eat til hours later. Thanks in advance for a reply! Hi Tanya- My preference would be to have it warm for the sake of the texture of the cheese. That said, I think you could make it ahead of time, reheat, and then pop your garnish on it!